00:45:00 Makes 2 servings, 1/2 recipe (422 g) each. Makes 2 servings, 1/2 recipe (422 g) each. Cream cheese product and Parmesan cheese make a quick skillet sauce for this easy supper for two. Mix cracker crumbs and 1 Tbsp. Parmesan on small plate. Rinse chicken with cold water; dip in crumb mixture, turning to evenly coat both sides of each breast. Press crumbs gently into chicken to secure; set aside. Bring 1 cup broth and water to boil in medium saucepan on medium-high heat. Add orzo; simmer on medium-low heat 9 min. or until most of liquid is absorbed and orzo is tender. Meanwhile, heat oil in large nonstick skillet on medium heat. Add chicken; cook 5 to 6 min. on each side or until done (170ºF). Remove chicken from skillet, reserving drippings in skillet; cover chicken to keep warm. Add cream cheese product and remaining broth to drippings in skillet. Bring just to boil on medium heat, stirring constantly. Simmer 3 min. or until sauce is thickened, stirring frequently. Meanwhile, add vegetables to orzo mixture; simmer 2 min. or until heated through, stirring frequently. Spoon orzo mixture onto 2 serving plates; top with chicken. Stir remaining Parmesan into cream cheese sauce; spoon over chicken. Orzo is a small rice-shaped pasta. 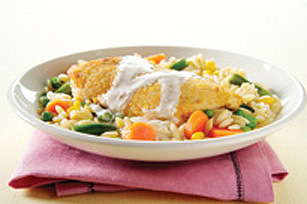 Cooking it in the broth produces a creamy flavourful base for this tasty chicken dish. Add a pinch of cayenne pepper to the crumb mixture before using to coat the chicken. This flavourful chicken recipe provides a good source of calcium from the cheeses. Serving Size Makes 2 servings, 1/2 recipe (422 g) each.